Custom made to size, Mid-Century Modern Industrial style glass and polished iron coffee table. Can be made to customer specification. Similar design available in dining table or side table versions. Table can support stone, wood or glass. Other finishes available. Charge can vary based on size or type of top. Lead time 10 to 12 weeks. 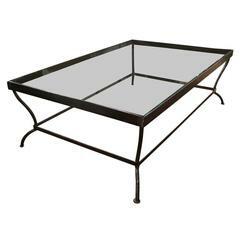 Indoor or outdoor iron and glass coffee table has hand-forged structure and legs. Tabletop is square with rounded corner edges. Rod iron contains some weathering. Beautiful sleek minimal coffee table make from mirror polished stainless steel and staphire ultra clear glass. New: made to order and can be customized. Incredible square custom modern Lucite and glass coffee table in the style of Yves Kline and Charles Hollis Jones. Polished steel coffee table with brass highlights with inset glass top and center stretcher, French 1960s, Maison Jansen. Beautiful polished steel coffee table. Has glass top and cabriole legs. Custom coffee table with 19th century basket-weave iron element inset into a new steel base, under a glass top. 36 inch square glass and chrome coffee table. 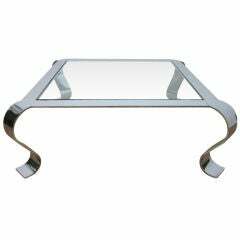 High quality 1/2 inch glass and chromed steel frame. Possibly designed by Milo Baughman or Laverne. Polished bronze and glass coffee table. Glass is approximately one inch thick. Four individual bronze bases which weighs approximately 22 pounds each.